Serves: 6 people Difficulty ': Easy Preparation time: 30 minutes INGREDIENTS 350g + rest. 180g ricotta cheese. 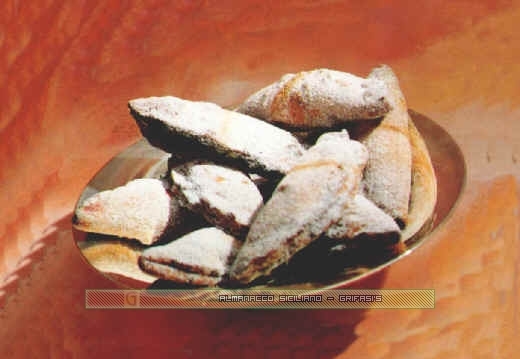 flour 3 eggs 4 tablespoons sugar grated rind of 1 orange 60g. raisins 1 pinch of baking soda 1 tablespoon Grand Marnier oil for frying powdered sugar In a salt -------------------------- PROCEDURE ricotta terrine worked vigorously passed through a sieve. Add the eggs, sugar, grated orange rind, a pinch of salt, baking soda, Grand Marnier, raisins (which you must soak in warm water), drained and squeezed and finally, add the flour. Mix thoroughly and let the dough rest for at least 1 hour. Put a pan on the stove with olive oil and it will just 'hot dip a spoon, the mixture. When the tortellini are puffed and golden, remove them with a slotted spoon and put them to drain on paper towels so that 'lose the excess oil. 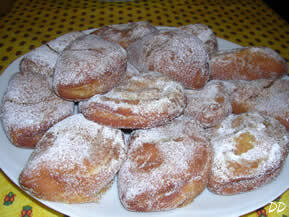 Then put them on a platter or serving dish sprinkle with icing sugar. Serve hot.